Yesterday, I covered Topaz Adjust and an extreme enhancement to a photo. By using the Color tab in Topaz Adjust, I was also able to apply some color lighting effects at the same time. 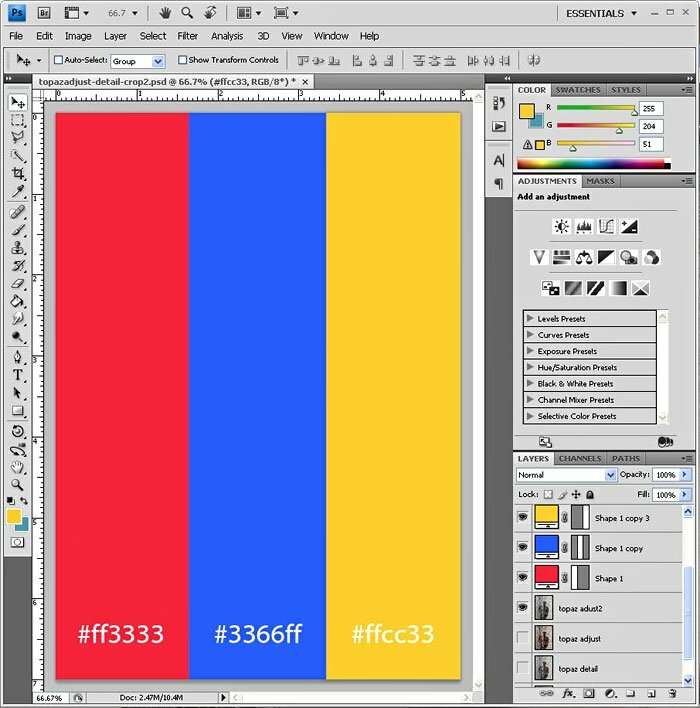 Suppose you want more control over the application of colors? I used the Detailed preset in Topaz Adjust to bring out the contrast in the water spray. The photo looks pretty good like just like that. But, it would need more dramatic color for use in an ad. There are certain colors which are typically used in special effect photography. 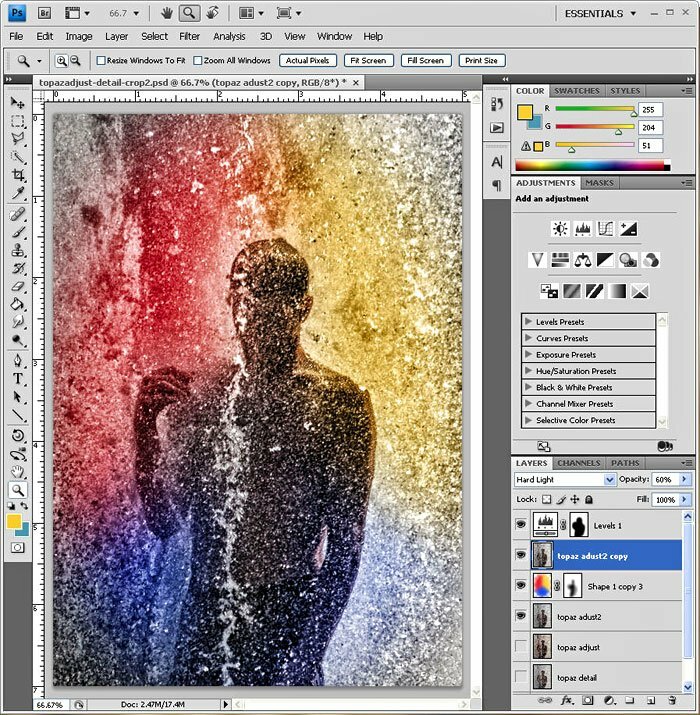 The above colors are available in both camera filters, gel filters for stobes/flashes and even Photoshop’s new Photofilter Layer. I used the Smart Shapes to create rectangles of each color. Once I had the bars correctly arranged, I merged the bars into one layer. Gel filters for strobes are sold in sheets which can be cut to suit your needs. I remember watching one photographer using a tr-color strobe to produce some wild lighting. I am using the above bars to recreate that multi-color “strobe”. Simply go to Filters > Distort > Polar Coordinates. 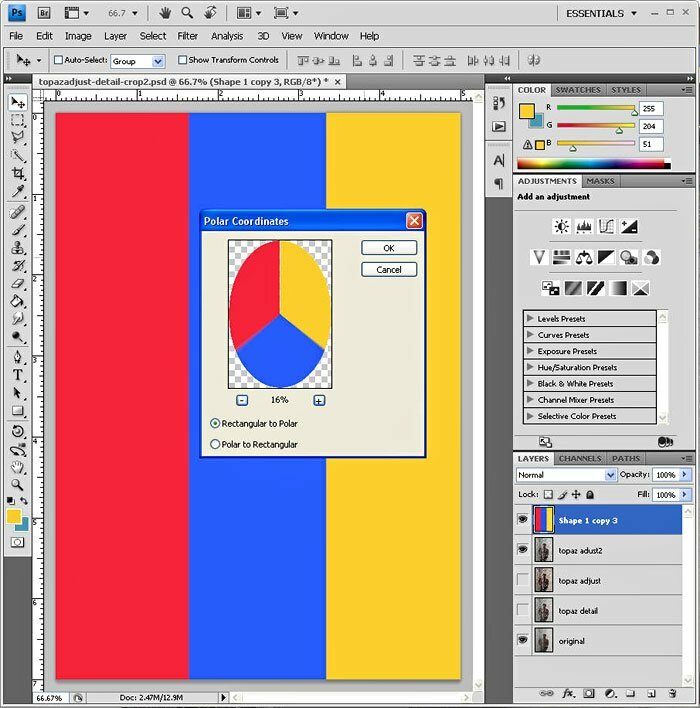 This filter will convert the color bars into a “pie”. With a real strobe, there would be bleed from one color into the next. Depending on your desired effect, you can apply a Gaussian Blur with a radius of 75 pixels or higher. I am sticking with the 75 pixel radius so that you can see the color transition in the final step. 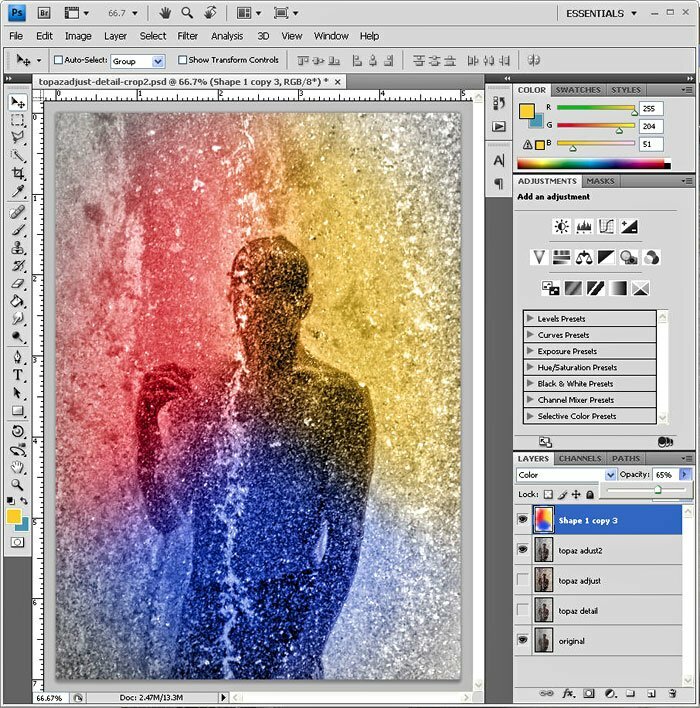 Make sure the color strobe layer is on top of the enhanced image from Step 1. 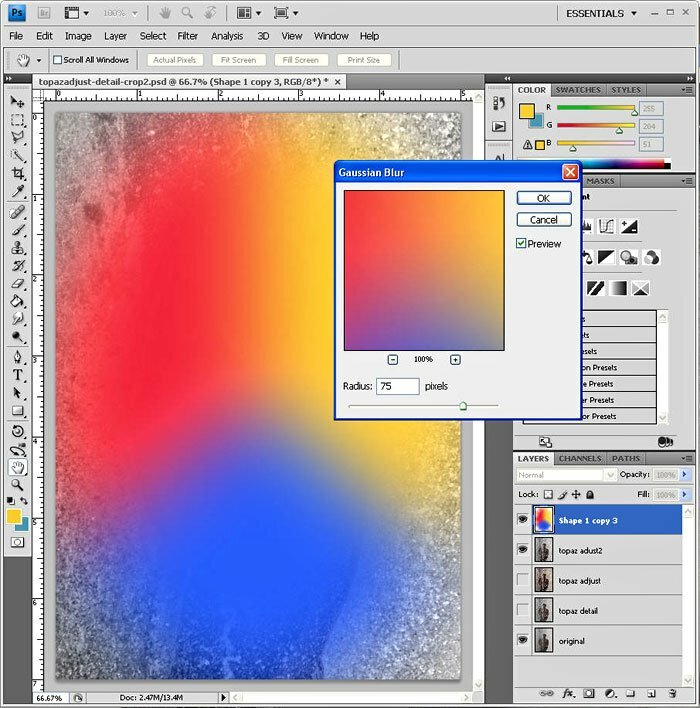 In applying the color effect to the image beneath, I am using Color for the layer blending. 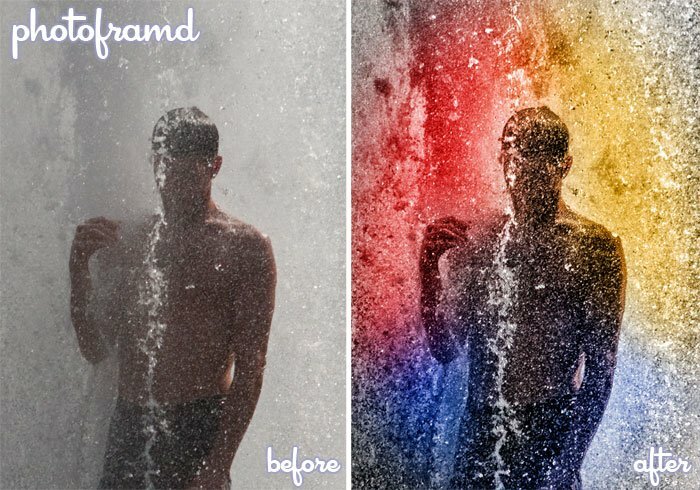 You can also experiment with different blending modes like Soft Light, Multiply or even Overlay for different effects. Note that I am lowering the layer opacity to 65% to reduce the color effect. To simulate a backlight effect, I added a layer mask to the color strobe. Since there would be bleed-through, I applied a Gaussian blur with a radius of 50 pixels to the layer mask. This will allow for some natural dimensional color to wrap around. 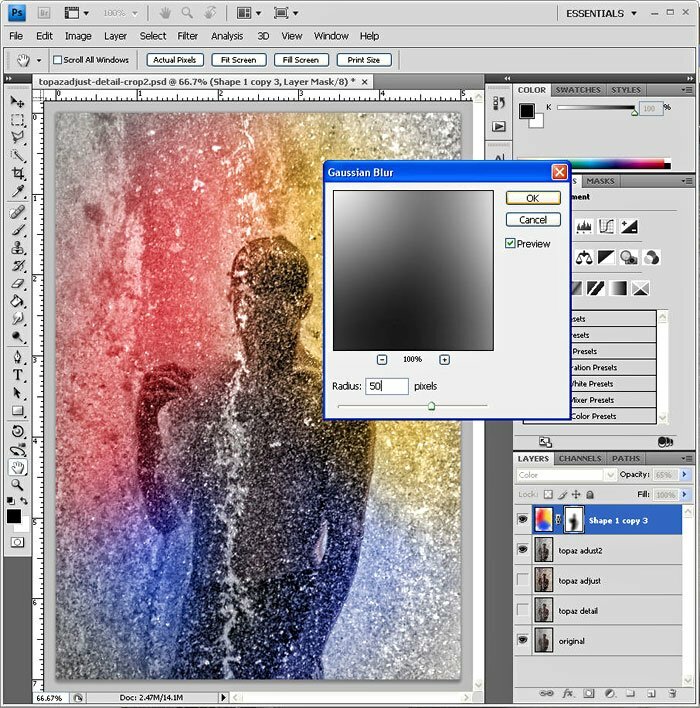 You could stop with Step 6, but there are some other variations — In the above version, I duplicated the enhanced image layer and placed it above the color strobe layer. I then set the layer blending mode to Hard Light. This step added a little more depth to the colored water. I then added a Level layer with a mask (in the shape of the model) above all layers to bring out a little more contrast. 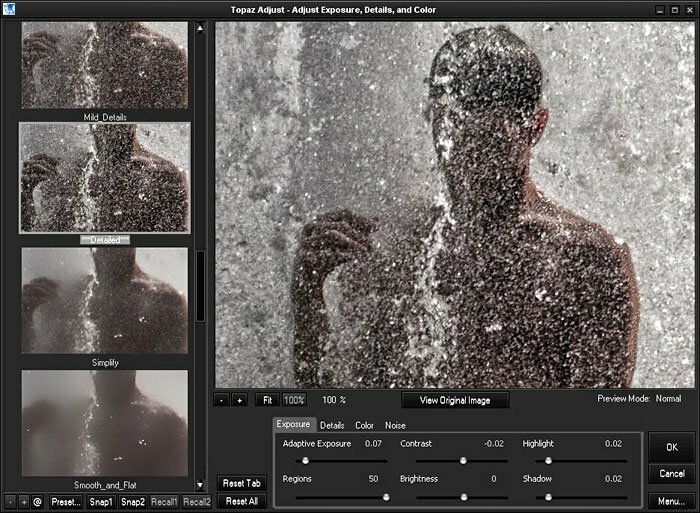 You can vary the effect even further by altering the shapes on the color strobe layer. Instead of using a tri-color pie, you could use round balls of color. Just be sure to blur the edges to simulate the different color lights mixing together. Now that adds Mood to an otherwise plain picture!